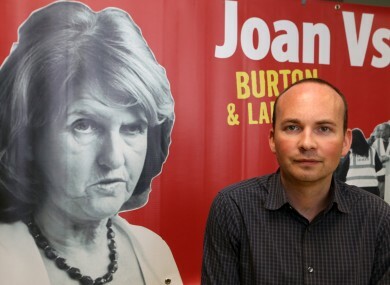 A JURY HAS been selected for the trial of Solidarity TD Paul Murphy and six other men on charges of falsely imprisoning Joan Burton in Tallaght in 2014. Paul Murphy (34), together with South Dublin councillors Kieran Mahon (39), Michael Murphy (53) and four other men have entered not guilty pleas on charges of falsely imprisoning of then Tánaiste and Karen O’Connell by restricting their personal liberty without their consent at Fortunestown Road, Jobstown, Tallaght on 15 November, 2014. Judge Melanie Greally has told the jurors the case is expected to last six weeks and the trial is expected to begin at 2pm tomorrow. Following a jury selection process that took three-and-a-half hours and in which over 100 potential jurors were called in a random ballot, a jury of five women and seven men were selected. Murphy of Kingswood Heights, Tallaght, Mahon of Bolbrook Grove, Tallaght, Michael Murphy of Whitechurch Way, Ballyboden, Dublin, Frank Donaghy (71) of Alpine Rise, Tallaght, Ken Purcell (50) of Kiltalown Green, Michael Banks (46) of Brookview Green, Tallaght, and Scott Masterson (34) of Carrigmore Drive, Tallaght have all been arraigned and entered not guilty pleas. During the selection process some potential jurors were excused after speaking privately with the judge. Further members of the panel were excused following challenges from the defence and prosecution legal teams which is provided for as part of the jury selection process. One person was excused after she indicated that she had holiday booked in seven weeks time. Judge Greally told the jury they must be satisfied they can stay with the case for at least six weeks. She outlined that they could not serve if they knew any or had any connection to any of the parties involved in the case or their families. She said they should not serve if they had any substantial knowledge of the events over and above what was in the public domain and which would affect their impartiality. Greally told the jury panel that people from the Fortunestown Road and surrounding roads should not serve. She said people from the wider Tallaght area should be cautious and carefully consider if they had any connection to parties or events in the case. She said the fact a person was from Tallaght or Jobstown did not preclude them from serving if they were satisfied they could be impartial. Greally said people employed by Irish Water or subcontractors, as well as their immediate families, or people who had engaged in installation of water meters should not serve. She said people working for An Cosán, outside where the alleged incident took place, or the Department of Environment should not serve. She said people active in campaigns for or against water charges on a formal or informal basis should consult their conscience and not serve if their views on water charges, water protests or water protesters was so strong that they could not be impartial. Greally said people who shared the political views of the defence or prosecution witnesses should ask themselves if they could approach the case with the necessary impartiality. She said if anyone had expressed themselves on the internet, in print or broadcast media or on social media or online comment pages and made statement about events or witnesses in this case they should bring it to the court’s attention and be ready to describe the comments. The judge had earlier given details of certain categories of people who were disqualified from serving such as practising barristers or solicitors, gardaí, prison officers, members of the defence forces and court service employees. The jury panel were told Paul Murphy was a full time public representative and member of Dáil Éireann. Kieran Mahon and Michael Murphy are county councillors with South Dublin County Council. Masterson is a self-employed courier, Donaghy is a retired construction worker and Purcell works in a factory. Judge Greally told the panel that Banks is not in any occupation that would bring him into contact with the general public. Email “Jury selected for trial of men accused of falsely imprisoning Joan Burton”. Feedback on “Jury selected for trial of men accused of falsely imprisoning Joan Burton”.